IST Austria processes applications to its PhD program once a year, in January. All admitted students start the program the following September. On-line application for the 2013/14 academic year is open now. Highly qualified students from all disciplines of the natural sciences, mathematics, computer sciences, and any interdisciplinary areas, who are committed to pursue their scientific career in an international research environment, are invited to apply. All applicants must hold a Master’s or Bachelor’s degree (or equivalent), or anticipate the completion of the degree before September 2013. Participating students are expected to be proficient in written and oral English. IST Austria is committed to Equality and Diversity. In particular, female applicants are encouraged to apply. Deadline for students wishing to enter the program starting in September 2013: Application files and reference letters must be received by January 15, 2013. All applications will be reviewed and ranked by a selection committee consisting of professors of IST Austria. Short-listed candidates will be invited to IST Austria for interviews and a campus visit in March 2013. Travel expenses will be reimbursed and free accommodation will be provided. Final admission offers will be made shortly after the visit. The deadline for students to accept or decline an offer is April 15, 2013. All PhD students admitted to the program will be offered employment contracts at IST Austria and will receive an internationally competitive salary with full social security coverage. Entering students holding a Master’s degree will have four-year contracts, and students holding a Bachelor’s degree, five-year contracts. The contracts will be extended by one additional year if satisfactory progress is made towards a PhD degree. Housing – a guest house and four apartment buildings – is available on the IST campus. Depending on availability, a room or apartment can be rented for a period of up to one year after arrival, giving incoming students time to find suitable accommodation for the subsequent years. All applications must be received on-line through a web site. The deadline for submission is January 15, 2013. When applying, you will have to create an on-line account with us, which will allow you to track your application through its various stages. Please note that you will not be able to switch between the different steps. You do not need to complete the process in one sitting, but you can return to your account until you submit the application. Once you have submitted your application, you won’t be able to make changes! In order to apply for the PhD program at the IST Austria graduate school fill out the PhD APPLICATION FORM. Register on-line by entering your name and e-mail using the link listed above. You will receive an e-mail with the link to your user account immediately. Enter the names and e-mail addresses of 3 referees who have taught you or supervised your work and are therefore able to evaluate your academic and research performance. They will receive an e-mail directly from us with the subject “IST Austria – Request for Letter of Recommendation” with a link to an online platform. Before submitting your referees’ details, make sure that they are willing and available to provide their recommendation within the given deadline (January 15). Keep in mind that your recommenders need time to write and submit the letters! Please note that you will not be allowed to upload scanned letters of recommendation yourself! All letters of recommendation must be submitted by your referees via this platform. Please note that we are unable to process your application without letters of recommendation. These letters are an integral part of your application, and it is your responsibility to ensure that all letters of reference are submitted by January 15, 2013. In this step you will need to enter a resume/CV, a statement of purpose, details on your university education, and inform us which research area(s) you find most interesting. We recommend that you compose your CV and Statement of Purpose using a word processor, and then “cut and paste” it into the application. You will also be able to upload the documents in PDF format. Make sure that you fill in all fields (resume, statement of purpose). If you wish to upload documents in the next step, make sure that you tick the appropriate box! Once you have moved on to the next step, you won’t be able to return and make changes. In your resume/CV include your educational history since high school, relevant work experience, additional qualifications, list (if any) publications, scholarships, awards, etc. The statement of purpose is a 1-2 page essay in which you should explain why you want to enter our PhD program, the research area(s) you find most interesting, and indicate which professor(s) you may be interested in studying with. You do not need to contact specific group leader(s) at this point. Upload PDF copies of your university transcripts and diploma certificates. All applicants must hold a Master’s or Bachelor’s degree (or equivalent), or anticipate the completion of the degree before September 2013. If your current course of study is still on-going, please provide the latest transcript and state when you expect to receive your degree. In this step you will also be able to upload additional supporting documents such as publications, TOEFL/IELTS and/or GRE scores. As the language of instruction is English, these documents are helpful, but not mandatory. IST Austria TOEFL code: 6384. Step 6: Submit your application. The deadline for submission is January 15, 2013, 24:00 CET. Once you have done so, you won’t be able to change your application. At this stage you will be able to track the status of the letters of reference, and – if need be – are able to send out reminder e-mails. 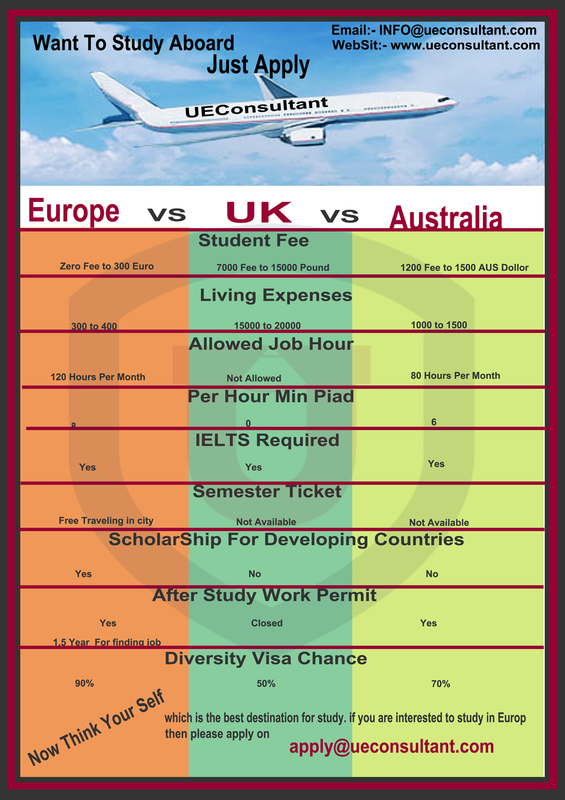 Why study nationally and pay more when you have opportunity to study international and pay nothing. Study free in German universities without paying any fee “Free Education”.in Top universities.Student with BSC(4 Years)or BE (4 years) + IELTS 6.0 or better are eligible for admission. Study free in European universities without paying any fee “Free Education”.in Top universities.Student with FSC + IELTS 6.0 are eligible for admission. The Netherlands Fellowship Programmes (NFP) are demand-driven fellowship programmes designed to promote capacity building within organizations in 61 developing countries by providing training and education to their mid-career staff members. The NFP is funded by the Netherlands Ministry of Foreign Affairs under the development cooperation budget. The scholarships allow candidates to receive a postgraduate education and to earn a Dutch Master of Arts degree, a Master of Science degree, or a Professional Master’s degree. Dutch Universities and academic institutions. Half of the available fellowships should be awarded to female candidates and the other half should be spent on candidates from sub-Saharan Africa. Apart from this, priority is given to candidates from priority groups and/or from marginalized regions to be defined by the embassies. An NFP fellowship is intended to supplement the salary that the fellowship holder should continue to receive (at least partially) during the study period. The allowance is considered to be a contribution towards the cost of living for one person, whether in the Netherlands or in another country. The fellowship can also cover the costs of tuition fees, visas, travel costs, insurance and thesis research. • endorse the objective and the aim of the NFP. The aim of the NFP cannot be reached if the fellowship holder does not return to his or her own country. Nuffic would like to urge fellowship holders to return to their home country upon finishing the course or programme to meet the NFP aim in the most effective way. As stated above, to be eligible for an NFP fellowship, candidates need to be admitted to the master’s degree programme for which they would like an NFP fellowship. Thus, candidates must first apply for admission directly to the Dutch institution that offers the master’s degree programme of their choice. For 2012-2013, the deadline for fellowship applications is 7 Februrary or 1 May 2012 depending on the course (see the NFP course list for 2012-2013 to know the specific deadline for your chosen course). The deadline for academic applications is earlier, about 1-2 months earlier than the fellowship applications deadline. Therefore, candidates are strongly advised to start the application procedure for admission as early as possible. and they can check the status of an application. Other parties such as the Dutch institutions, the embassies and consulates will use SOL to assess NFP fellowship applications. SOL can be accessed through the official website starting 1 November 2011. It is important read the NFP brochure 2012-2013 and visit the official website (link found below) for detailed information on how to apply for this scholarship.